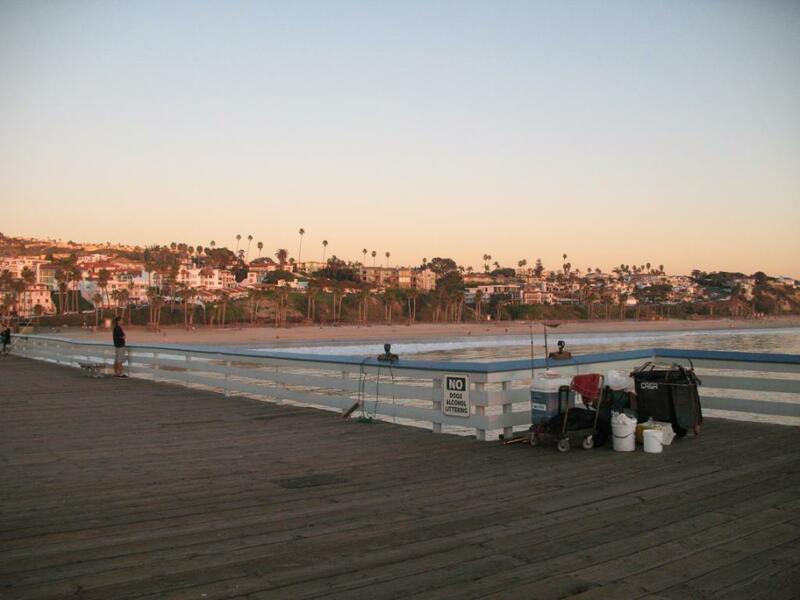 Scene One — The hooking of a giant (black) sea bass was not that unusual given that the San Clemente Pier is one of the main piers that sees the large fish on a regular basis. The release was something different. During the summer of 2017 one of the big bass was hooked and fought at the end of the pier. At the end of the fight the fish was netted, brought up to the pier, and the hook removed. The fish was released back into the water where it promptly went belly up and seemed a goner. The large crowd that had witnessed the capture seemed stunned but what really could be done? One brave young lady, age unknown but probably in her early ‘20s, answered the call. She stripped into her skivvies and dived off the pier. She grabbed the giant fish and began to help it swim. In time, the large fish regained equilibrium, seemed rejuvenated, and swam strongly away. The young “life saver” swam back to shore and a number of less gallant warriors volunteered to take her clothes to the beach. Scene Two — When the bonito show up everyone gets excited. Excitement was certainly in evidence on an early morn in August of 2017 when a large school of bonito visited the pier. Bonito seemed to be everywhere with fish being caught from the inshore surf area out to the end. Some were caught on the traditional ball and feathers, some on Sabiki multi-hook rigs, and some on bait. They seemed everywhere. However, what happened at the end of the pier was even more exciting. Out at the end the bonito began one of their patented boils where the surface of the water seemed to be torn to shreds by the hungry fish and the bait they were chasing. Fish were on the surface and birds were circling above, but there was another visitor. As anglers watched the melee, a large shark, an 8-10 foot-long mako shark, rose from the depths and soared out of the water in pursuit of the frantic bonito. The bonito themselves and the “boil” had been exciting but nothing compared to the spectacle of seeing that large shark launch itself totally out of the water as though shot from a cannon. It would give the anglers a story to repeat for years to come. As for myself, I was almost there. I arrived at the pier in the afternoon and soon heard the story of the mako shark. Fittingly, it was a shark that was known for decades on the West Coast as the bonito shark. Scene Three — You’re helping to put on a fishing clinic for newbies and you are busy cutting bait, rigging up rods and reels, showing people how to cast, helping net fish, untangling lines, and running around taking pictures—near the front of the pier. Finally, just about the time when you are ready to pack up, someone says, “what did you think of that shark?” “What shark?” “The great white that was cruising up and down the pier out toward the end!” “What?” Yes, it turned out that a great white had decided to visit the pier during the class I was helping to present in 2017. I was there but I never even saw the shark. Duh! Scene Four — If I’ve ever felt like I was in a movie, it was at this pier. Picture an early April morning in San Clemente, the kind of serendipitous morning that helps travel writers wax poetic and draw commissions from travel agencies. I had arrived at the parking lot about 5:15 A.M., headed down the incline to the pier, and stopped just past the breaker area where an overhead light on the pier afforded illumination for the darkness before the dawn. It was cool but not cold, there was little if any breeze, and the prospects were high for a beautiful day. By 5:30, I had a mussel-covered hook in the water and less than thirty seconds later I had my first fish, a small yellowfin croaker. Yes, prospects looked very good for the day. However, the second cast failed to yield a quick bite and I began to relax. It was then that I noticed a deafening silence (oxymoron time) on the pier—and the sea gulls. I was surrounded by sea gulls, an assemblage of what seemed to be several hundred or so motionless gulls seemingly devoid of sound. And, they all seemed to be intently watching me, and the bait sitting next to me near the railing. I felt as though I was in Alfred Hitchcock’s movie The Birds and was waiting for the inevitable attack. Of course, it never came! The birds dispersed with the coming of light and the arrival of more people to the pier. But it was enough to give a person a case of the heebie-jeebies—the creeps. It was a strange, strange feeling. Environment. The pier has become on of my favorites over the years as much for the atmosphere as the fishing, although the fishing can also be pretty good. 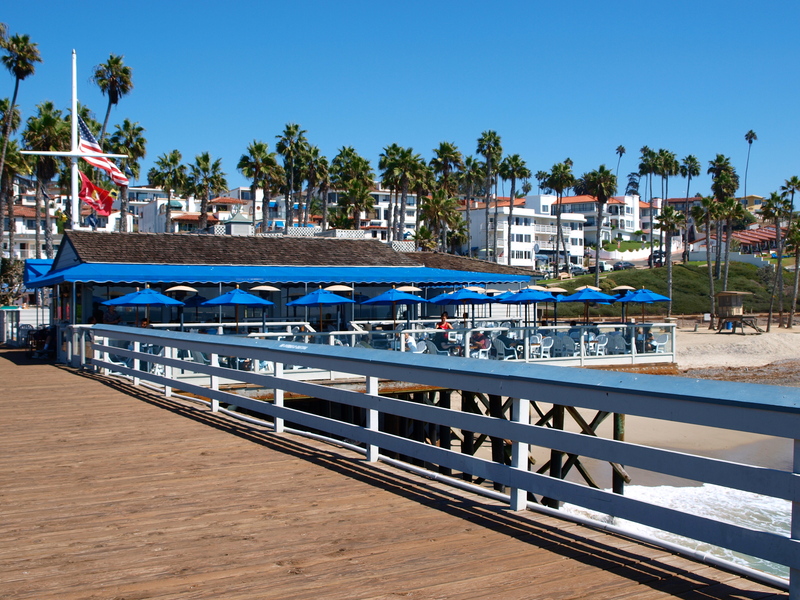 This pier itself has a friendly, clean, somewhat old-time touristy feel with white painted railings and light blue trim (similar to Crystal Pier in San Diego). I first fished this pier in the late 1960s with tepid results. However, since the ‘80s I have fished the pier almost yearly and have had consistently good results. 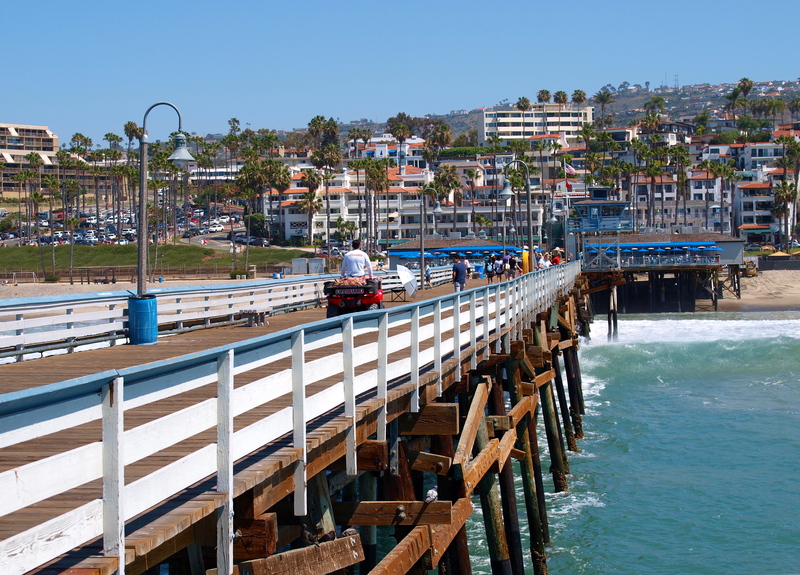 As for the area, San Clemente has the feel of an old, Spanish-era, California town. Developer Ole Hanson’s vision was to develop a “Spanish village by the sea” and he built his town using Spanish architecture and Spanish names for the streets. To insure conformity, Hanson required in his deeds that new home construction “had to be Spanish-style houses of white stucco and handmade red tile roofs.” Given that San Clemente sits only eight miles from San Juan Capistrano, home to a famous mission and swallows that used to return each March, I’m a little surprised he didn’t have some sort of requirement for birds. Perhaps the doves of San Clemente? Certainly the doves of San Clemente would be better than the gulls of San Clemente (they’re just not the same!). But it worked; his town did have the feel of a Spanish village, if a somewhat upscale version. 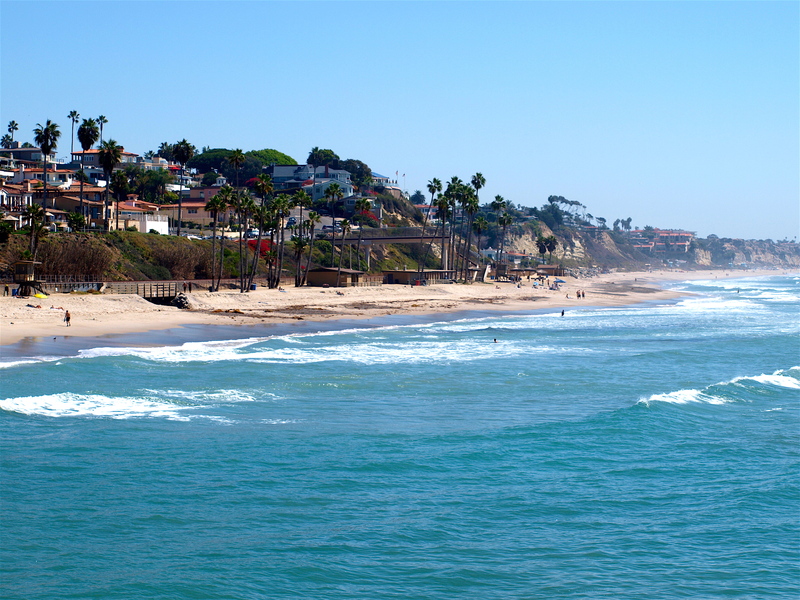 Many newspapers, including the Los Angeles Times, used the moniker “Spanish Village” to describe San Clemente well into the ‘40s. It’s no longer a village but a town that has been kept up and improved over the years. A plethora of beautiful homes, pricey condos, and expensive apartments all set amidst lovely gardens and stunning ocean views. 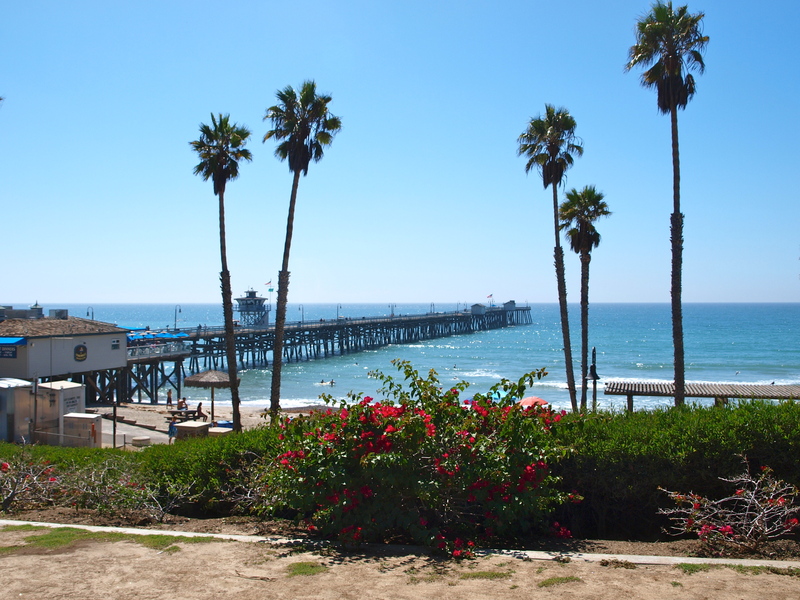 San Clemente was once the home of the “Western White House” when Nixon was President and it’s easy to see why the town was his choice. 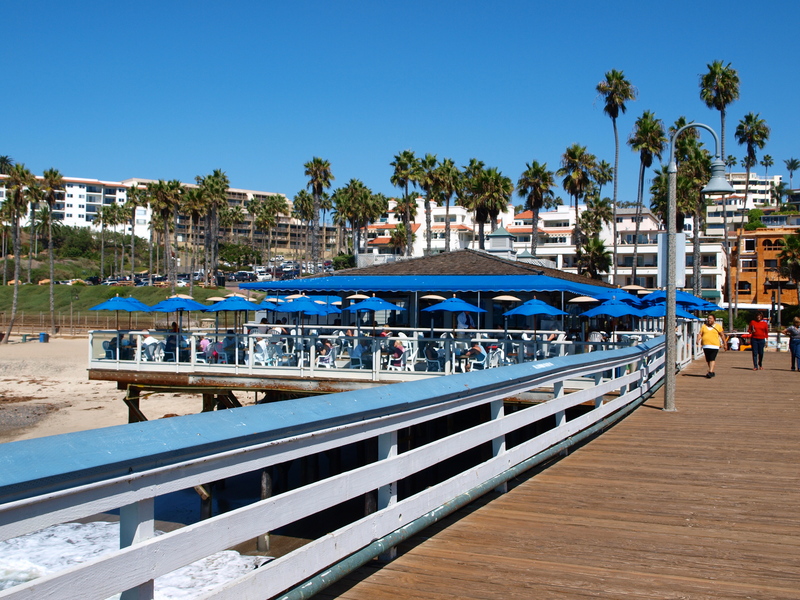 The pier itself is located down Avenida del Mar, the winding road that heads down to the sea from El Camino Real (The Royal Road). It’s a little difficult to find if you don’t know where to look (so follow the signs that indicate “pier”). 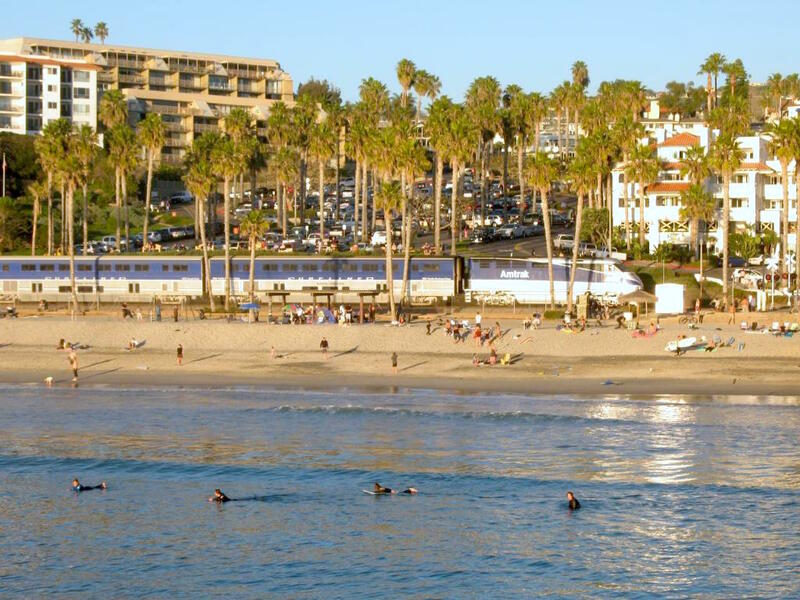 At the bottom of Avenida del Mar there’s a fine beach—the San Clemente City Beach—upon which sits the pier. Just up from the beach are two fairly large parking lots that unfortunately fill quickly on weekends and almost any summer day. Nearby sit grassy lawns, a park, and the Casa Romantica Cultural Center and Gardens. Across the street from the pier is a small area populated with shops and restaurants. The area has somewhat of a Mediterranean feeling to it, and on a warm summer night has a classy ambiance matched by few piers. 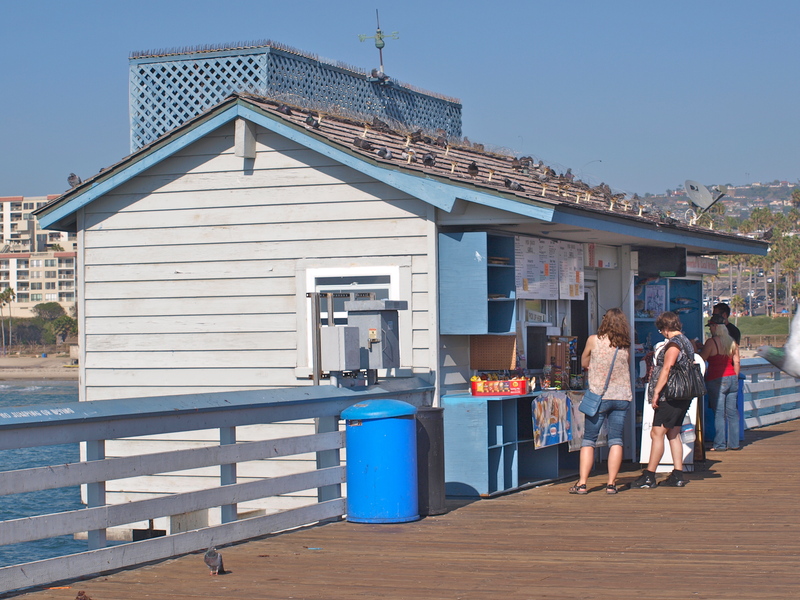 At the front of the pier, on a wide section, sits the Fisherman’s Restaurant. On the south side is the main dining room where I have had some excellent fish (including yellowtail, white seabass, and halibut). On the opposite, north side of the pier sits the restaurant’s oyster bar. Here you can have a lighter (and less expensive meal), an appetizer, or simply a drink. 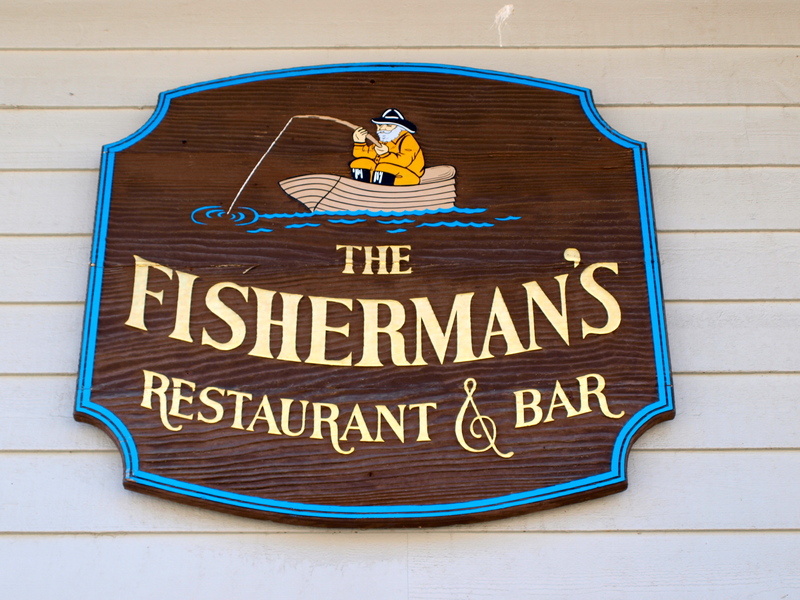 I’ve always enjoyed their fish chowder, clam strips, fish and chips and other goodies. Walking between the two parts of the restaurant, and trying to ignore the good looking food on the plates, leads you out onto the narrower, main part of the pier. There is a second, wider T-section mid-pier, one that seems to be a favorite for anglers but I’ve never found it to be a particularly successful spot. About three quarters of the way out are the restrooms and just before the end is a combination snack bar and bait and tackle shop (see the pier facts at the bottom). Lastly there is the end section, wider and the favorite spot for the young Turks— the shark anglers. At times you may feel that you are in a fish bowl as the tourists and restaurant patrons walk out on the pier to check out the action, but the pier is usually in excellent and clean condition. 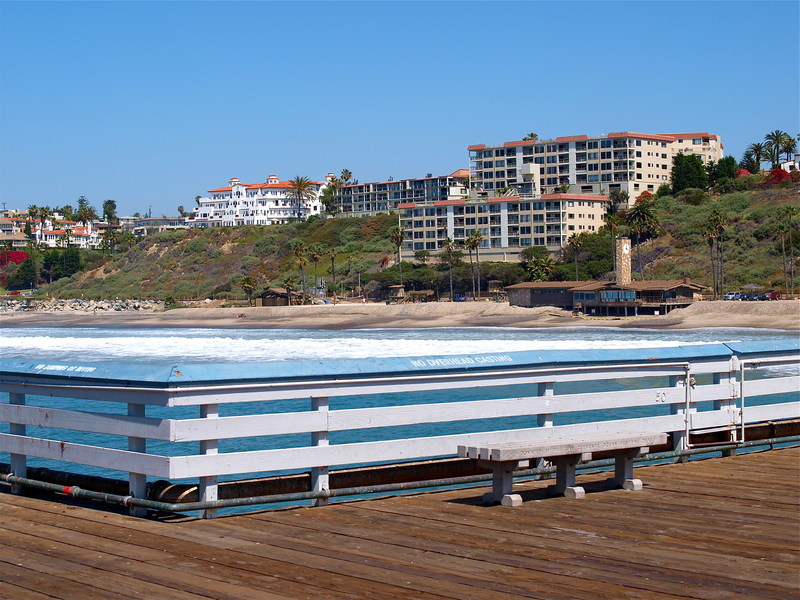 Often in the morning you will find the pier populated by local sexagenarian (or older) joggers, many of whom probably bought their million dollar homes back when the homes were $50,000 (and that figure was considered high). 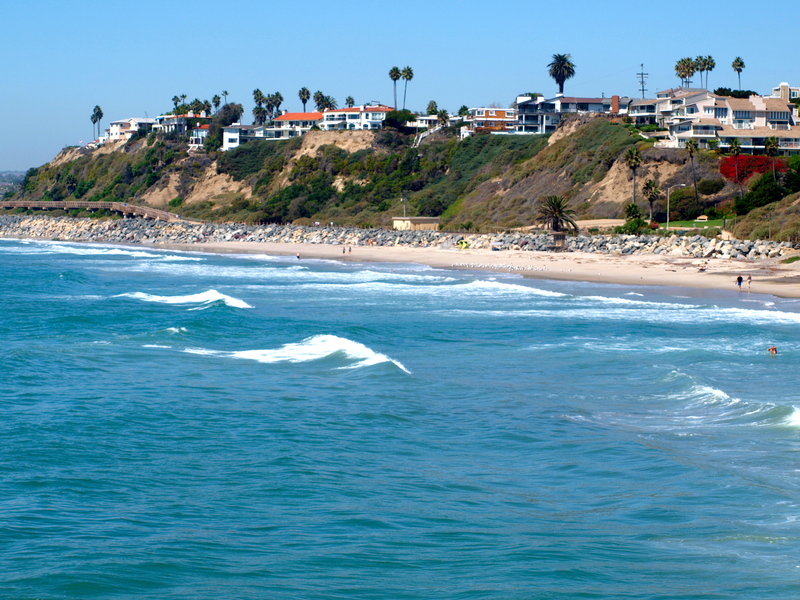 But the vulgarities of real estate in coastal SoCal are only one topic of many to be discussed, debated, and gossiped about by those enjoying a pier jog in the morning sun. You seem like the kind of guy that I would like to fish with when I come out there from upstate New York on may the forth to see my new great grandson. I would like to have someone show me the ropes on California pier fishing. I’m a 50+ year fisherman with a living room full of trophies, but I would like to fish with someone who has it down pat on the pier. I’m sure it’s pretty much the same as on the jersey sure, but I would like to save some time figuring it out.if you are interested, I’ll buy the bait.you can even give me a call. (845-672-0365 ) mike tiritill. Mike, I am sorry but I would be unable to meet up with you on that day. I live several hundred miles away and though I visit San Clemente a couple of times a year I can’t do it on that date. I have sent your note to a couple of people who know that pier well and might be able to meet up with you. You also might simply make a post on the message board on pierfishing.com and a local might hook up with you. Best wishes and sorry I would be unable to meet you. Would love to hear the stories about fishing back east.